Called the Hairy Who, they were an early wave of what later became known as the Chicago Imagists. The Hairy Who were skillful technicians who used popular imagery with a playful approach. And more than 50 years after they emerged, they are getting their first major museum exhibition. Art Green. “Consider the Options, Examine the Facts, Apply the Logic (originally titled The Undeniable Logician),” 1965. Smart Museum of Art, University of Chicago, Anonymous Gift. © Art Green. Karl Wirsum. “Screamin’ Jay Hawkins,” 1968. The Art Institute of Chicago, Mr. and Mrs. Frank G. Logan Purchase Prize Fund. © Karl Wirsum. Jim Falconer, Art Green, Gladys Nilsson, Jim Nutt, Suellen Rocca, and Karl Wirsum. “The Portable Hairy Who!” 1966. The Art Institute of Chicago, gift of Gladys Nilsson and Jim Nutt. Jim Nutt. “Untitled,” 1966. The Art Institute of Chicago, gift of the Leonard and Ruth Horwich Family Foundation. © Jim Nutt. Jim Nutt. “Wowidow,” 1968. The Art Institute of Chicago, The Lacy Armour and Samuel and Blanche Koffler Acquisition funds; the Estate of Walter Aitken. © Jim Nutt. Karl Wirsum. “Youdue,” c. 1966. The Art Institute of Chicago, restricted gift of Mr. and Mrs. Samuel W. Koffler. © Karl Wirsum. Phil Ponce: Two floors of the museum have been invaded by the Hairy Who. Their name was a play on words when one of the artists misheard the name of the WFMT art critic at the time, Harry Bouras. Beginning in 1966, the Hairy Who were featured in a series of shows at the Hyde Park Art Center and around the country. Thea Nichols, co-organizer/researcher: The Hairy Who were six artists who came together, they named themselves, they organized themselves. They were all recent graduates of the School of the Art Institute of Chicago when they started showing at the Hyde Park Art Center on the South Side, and I think there was a cheekiness and sort of an idea that they were going to create their own context for their work. Ponce: Their art training was non-traditional. Ponce: They made a plan to present themselves as a loose collective of highly individual artists. Nichols: There was a lot of play and a lot of fun and a lot of joy and laughter in these planning meetings, and then they kind of got serious and went back to their studios as individuals, made their work. Pascale: One of the things that I think about their work is that it was sophisticated, sophomoric-type quality about it. There’s a lot of puerile sexuality, I think, in it. The common factor, I think, was that a lot of it was vernacular. They were interested in American culture and other cultures but particularly those things that you could find every day. So, children’s coloring books – they were especially interested in the movies, pop music, or rock ‘n’ roll, blues. Suellen Rocca, original “Hairy Who” artist: We all at the time had an interest in popular culture, but I think what was so unique about the Hairy Who and the Chicago Imagists’ interest in popular culture is there were lots of other influences as well from art history, could be Mesoamerican art, it could be Aztec art, it could be outsider art. Ponce: The six Hairy Who artists are Karl Wirsum, Gladys Nilsson, Jim Falconer, Art Green, Jim Nutt and Suellen Rocca. They are still with us, and we caught up with Rocca at the Elmhurst Art Museum, where she curated a new show of Imagist art from the Elmhurst College art collection. We asked her about beginning an art career in the 1960s. Rocca: The ‘60s were a reaction to the ‘50s, where there was so much conformity, and the 60s was a wonderful time to be that age and to have a youth revolution. Ponce: Back at the Art Institute, it’s a kind of homecoming for the artists, who literally went to school in the building. Nichols: At the time when they were students, the school was housed within the museum, so to get to class they were walking through these hallways every day. Rocca: We did walk through the galleries to get to school, and that was one of the things that I think all of us have cited that was so important about that experience, is that we were constantly in touch with works in the collection because literally we walked through the building to get to our classes. Pascale: The story hadn’t been told. There had never been an exhibition focused exclusively on them. And it was time to do it. Rocca: It’s wonderful that it’s happened. At the times when we had the shows I don’t think we were ever expecting that it would be shown at the Art Institute. The Hairy Who show at the Art Institute of Chicago runs through Jan. 6, 2019. 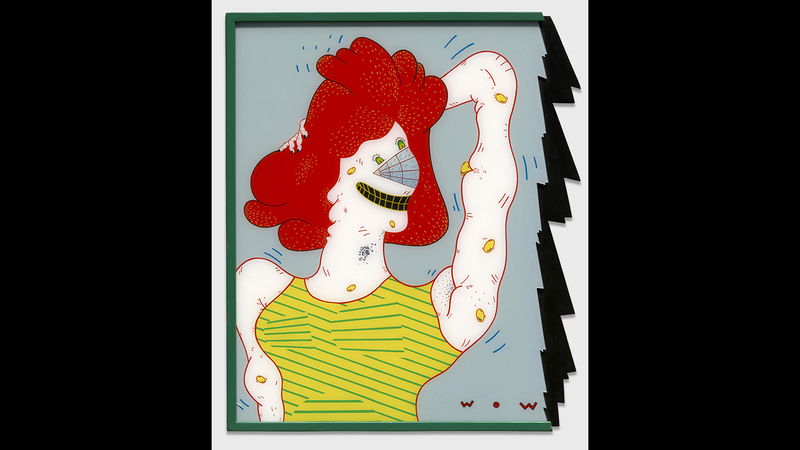 And the work of the Chicago Imagists can be seen at the Elmhurst Art Museum through Jan. 13.